Kenny Omega: From Nothing to Main Eventing the Tokyo Dome. From anyone who has watched Kenny Omega and his matches, promos and in general, his career. They have seen what he is actually capable of doing from making a match into a match to remember. Starting off in independent companies such as PCW, PWS, ROH, DDT, JAPW and PWG, Omega has practiced and perfected his craft and proven that even an Otaku gamer gimmick like his can be put into a great thing for a show. After being released by the WWE in 2006, Omega would embark on a mission to prove all the naysayers wrong, by getting more noticed in the Indy scenes which he did to later on get an opportunity to wrestle for New Japan Pro Wrestling. In his first match he teamed with long time friend, Kota Ibushi. They faced off against a legendary team known as No Respect which consisted of Gedo and Jedo. Being victorious in the match, they would later win the IWGP Jr. Heavyweight Tag Team Titles, only to lose them a few months later and stop teaming afterwards due to Omega turning Heel and joining the gajiin stable, Bullet Club. 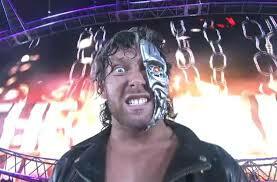 In Omega’s first PPV singles match in NJPW at Wrestle Kingdom 9. He defeated another legendary Japanese wrestler known as Rysuke Taguchi for the IWGP Jr, Heavyweight Championship. which he would hold for a few months before losing and regaining it from Kushida only to lose it a year after his huge singles win at Wrestle Kingdom 10. He would attack and fire Bullet Club’s leader, AJ Styles who was leaving NJPW to sign with the WWE. Omega would announce he was taking over as the new leader of Bullet Club, and going from a Jr. Heavyweight to a Heavyweight wrestler to compete for many more championship titles and takeover NJPW. In Omega’s first PPV now as a Heavyweight wrestler, he defeated the “Ace” of NJPW, Hiroshi Tanahashi for the vacant Intercontinental Championship in a huge main event that would be the start of Omega’s rise to the top. Months later, Omega lost the Intercontinental Championship and decided to instead compete in the 26th annual G1 Climax tournament which is a 2 week event where the A block with the most wins faces the B block and the winner gets a IWGP Heavyweight or NEVER Openweight Championship match in the main event at Wrestle Kingdom 11. After a long and grueling 2 weeks, Omega would make it to the finals facing off against Hirooki Goto and defeating him to not only win the G1 but to be the first gajiin to do so. because he proved that someone who people said would never make it, can make it and compete in the main event at Wrestle Kingdom 11, at the Tokyo Dome. and mark the first ever 6 star match in Pro Wrestling history. Omega is still young, he can still compete in more huge matches. If he still stays with NJPW next year or if he decides to go to WWE,Everyone knows that he can and will prove the naysayers wrong all the time, with every match he’s in and that is an already proven promise. This entry was posted in Wrestling and tagged IWGP, Kenny Omega, NJPW, Tokyo Dome, WWE on March 18, 2017 by Rami Hanna Jr.
John Cena Set to Induct Kurt Angle into WWE Hall of Fame. With what announced today by WWE and Kurt Angle with John Cena commenting on it. Cena will induct Angle into the WWE Hall of Fame on April 1st. From winning a gold medal for Wrestling in the Olympics to debuting in the WWE and winning many championships from world champion to European champion to a tag team champion. 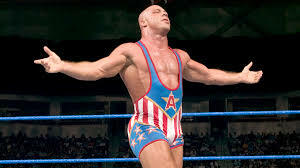 After leaving the WWE, Angle wrestled in many companies from all around the world, he was the IWGP Heavyweight Champion, the first TNA Heavyweight Champion and has also won many championships from other companies in his career. After leaving TNA last year. Angle took a small break from wrestling to focus on his life. But, this year he was announced as the first inductee into the WWE Hall of Fame, Class of 2017.
being a 16 time World Champion, winning the Royal Rumble twice and appearing and competing at 11 Wrestlemanias’. It’ll be great seeing the Olympic gold medalist get inducted and you can see him get inducted on April 1st on the WWE Network. This entry was posted in Wrestling and tagged Hall of Fame, John Cena, Kurt Angle, WWE on March 18, 2017 by Rami Hanna Jr.
Is Reigns Worthy Enough to Face the Undertaker at Wrestlemania 33? 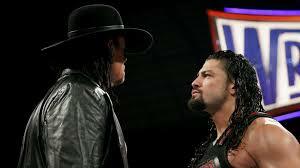 After what transpired last week on Monday Night Raw, It has been confirmed that it’ll be the Undertaker facing off against Roman Reigns at Wrestlemania 33. This is my opinion on if Reigns is or is not worthy of defeating the Undertaker at the event. Since Roman Reigns stepped away from the Shield, he has tried his hardest to get the fans to on his side. The thing is, Reigns hasn’t found a way to get a whole lot of support from the crowd. If you have watched Reigns through his career, you can see that he has been given everything. 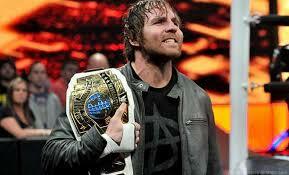 From NXT, he only wrestled a few matches before his call up, when he, Dean Ambrose and Seth Rollins formed the Shield. If you look at what he has accomplished, it’s all been done due to wanting the WWE to build him up. They want the crowd behind him every night, but the more they force him onto everyone, the more he’ll be resented. It takes time for somebody to be liked, names like John Cena, Edge, Chris Jericho, Kevin Owens, Brock Lesnar and Rollins would all be examples of that. The Undertaker has obviously had a monumental career, from his Wrestlemania streak, to going through over 25 years wrestling against the very best names. He has proven that even at an old age, he can still go toe to toe with anyone. In my opinion, I don’t find Reigns to be worthy enough of defeating the Phenom, the Undertaker at Wrestlemamia 33. It’s just not his time yet. This entry was posted in Wrestling and tagged Roman Reigns, The Undertaker, Wrestlemania 33, WWE on March 13, 2017 by Rami Hanna Jr.
Is Styles VS Shane Worth a Mania Match? Since AJ Styles lost his WWE Championship belt to John Cena at the Royal Rumble back in January, it has been rumored that Styles may face off against Shane McMahon at Wrestlemania on April 3rd. Since the beginning of 2016, Styles has made wrestling headlines, from Japan to America. The day Styles debuted at the Royal Rumble, you could tell that his name was hyped for a reason. Throughout all of 2016, Styles went against the very best in the business. These names included Chris Jericho, Kevin Owens, Roman Reigns, Dean Ambrose, Dolph Ziggler and John Cena. Styles even won the WWE Championship from Ambrose, and held it for over four months, before losing it to Cena. Now, what has Shane been doing this year? He returned at the beginning of 2016, and was put into a match at Wrestlemania 32 against the Undertaker, who defeated him in a Hell in a Cell match. Afterwards, Shane was named general manager of Raw, until he was eventually put as the commissioner of Smackdown Live. So, if you see it in a perfect view, Shane has done nothing worthy to face Styles at Wrestlemania 33. The WWE could make a huge match happen. Styles can face Ambrose for the Intercontinental Championship, or he can face Bray Wyatt and Randy Orton for the WWE Championship. Styles can even face someone from Raw, such as Samoa Joe, Seth Rollins or Kevin Owens. He can even face Chris Jericho in a Wrestlemania rematch from last year, this time for Jericho’s United States Championship title. But, if you put someone like Styles, who has had one of the greatest years in WWE History, against someone with zero momentum and hype like McMahon, you have a match that is destined to not be a memorable match for Styles, or the WWE Universe. This entry was posted in Wrestling and tagged AJ Styles, Shane McMahon, Wrestlemania, WWE on March 8, 2017 by Rami Hanna Jr. The Reason Why Braun Strowman Should Defeat Roman Reigns at Fastlane 2017. This Sunday will be WWE’S third time holding the Fastlane pay per view, There will be many matches being held, but the ones that I am looking forward to the most is Braun Strowman facing off against Roman Reigns. These men have been feuding since Strowman debuted the night after Summerslam with the Wyatt Family and attacked Reigns and Dean Ambrose on Monday Night Raw. This feud ignited once again when Reigns was on the verge of defeating current WWE Universal Champion, Kevin Owens’ until Strowman interfered and under “no disqualification” rules was able to aid Owens in the win by beating down Reigns and putting him through a table. The next night. Strowman would receive his promised Universal Championship match that would almost be an easy win, That was until Reigns got involved and made the match go to a disqualification which would allow Strowman the win, But not the Universal Championship. Strowman has proven that he is ready for anything, From defeating the World’s Strongest Man, Mark Henry to defeating the World’s Largest Athlete, The Big Show and after every match, He has had to deal with Reigns who has failed every ambush attack on Strowman. The reason why Strowman needs this win is to prove that he is in fact the next big thing for the WWE, He has the skills, the strength and the promo ability to hype himself and any match he is in. Many things can happen this Sunday at WWE Fastlane. This entry was posted in Wrestling and tagged Braun Strowman, Fastlane, Roman Reigns, WWE on March 3, 2017 by Rami Hanna Jr.
Alexa Bliss becomes first ever 2x Smackdown Women’s Champion! It was announced that Naomi would be forced to vacate her Smackdown Women’s Championship due to an injury. Minutes later, Alexa Bliss would demand to be given back the Smackdown Women’s Championship which was instead made into a match against former Smackdown Women’s Champion, Becky Lynch. At the end of the match, Mickie James would help Alexa Bliss defeat Becky Lynch and help her become the first ever 2x Smackdown Women’s Champion. Source for Image: The 434. This entry was posted in Wrestling and tagged Alexa Bliss, Becky Lynch, Smackdown Live, Women's Championship, WWE on February 22, 2017 by Rami Hanna Jr.